Arbed is a tool to work with Real Studio and Xojo projects. For OS X, Windows and Linux. It lets you inspect, compare and edit projects. It can synchronize code you want to share between multiple projects, show your changes between saved project versions, convert your strings into localizable constants, perform complex search and replace operations by scripting them, and much more a serious Real Studio developer can wish for. Obfuscate strings in your project to hide your SQL statements and other text in your executables. 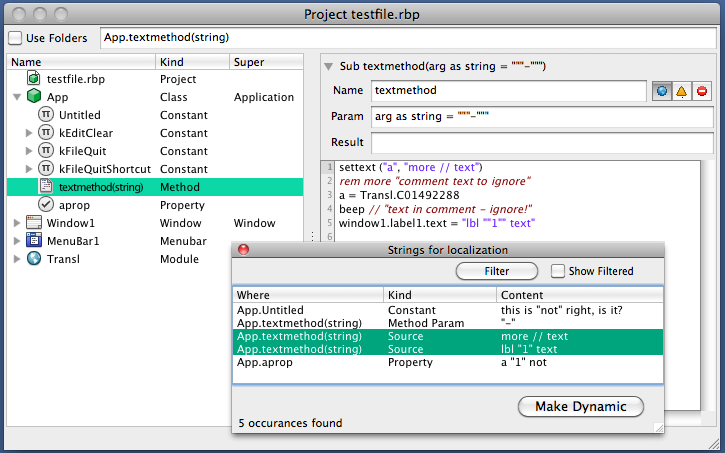 Prepare a project for Localization by converting all strings in a project into dynamic constants with ease. See example. 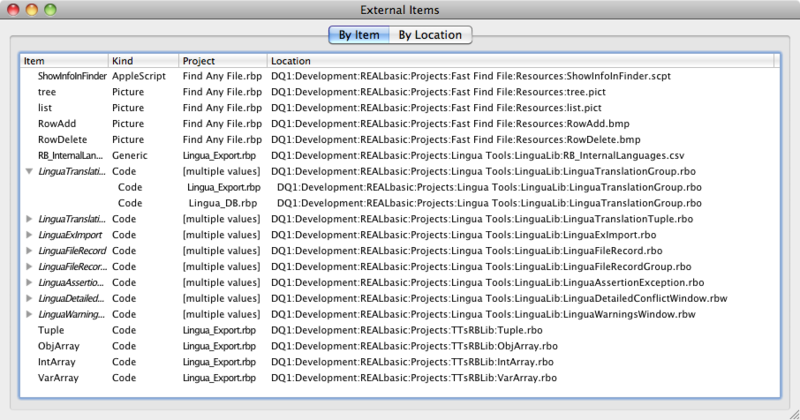 Search all projects on your disk for text. See example. Side-by-side comparison of projects, merging differences easily. See example. 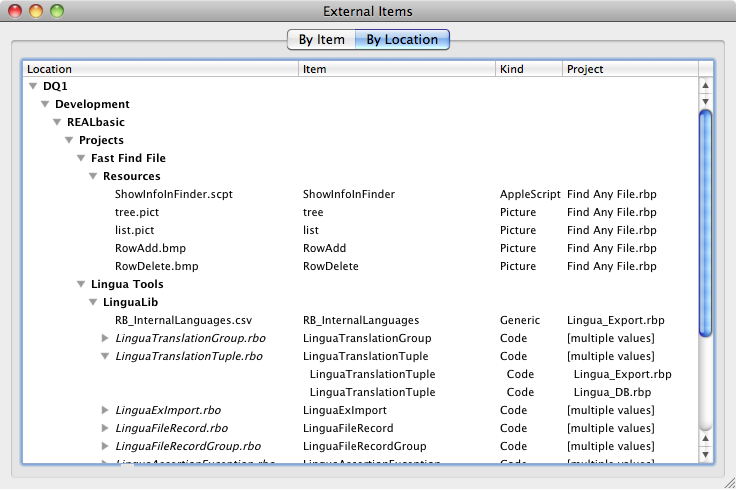 Can be used by Tower, SourceTree, SmartSVN, SmartGit as a viewer for version differences. Output entire project source code as formatted and colored HTML. Consolidate all external items (pictures, code, etc.) into the project or into a folder, e.g. for easier distribution of your source code. List all external items used by one or more projects. See example 1, example 2. Bulk deletion of project items (classes, methods, etc.) - select many items and delete them in one step. View and modify the order of Controls inside a Window or ContainerControl. Some features can be controlled via CommandLine arguments for mass processing, including generating a cleaner XML output format processing project files by your own tools. Can be scripted to perform more complex search and replace operations or simply browse all items of a project. Automatically keeps backup of projects you save in Arbed (can be turned off). 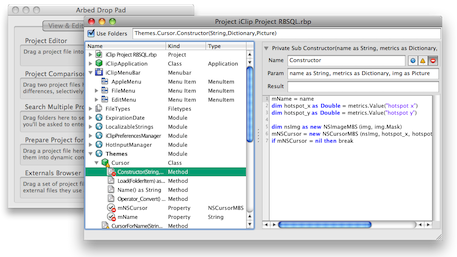 Want to see by which IDE version a binary project file was saved? Just open it in Arbed and select its "Project" item - you'll see this. 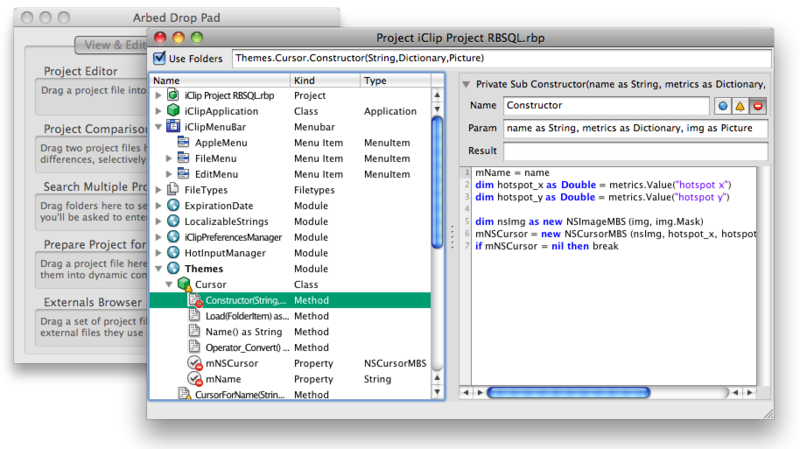 Be careful not to edit a project file in both Arbed and the Xojo IDE simultaneously. If the IDE has a project open, while you modify and save the same project in Arbed, the IDE won't notice. If this happens, you need to close the project in the IDE and then re-open the project so that the IDE sees the new version. If you edit source code in Arbed, all breakpoints in that method are lost once you save your changes. While many of its features are free, a license must be purchased for some of the advanced features, including all that require saving a modified project (such as: Comparison, Localization, Obfuscation, Bulk deletion), and source output to HTML. A basic feature license at US$ 29 offers all currently available features, just without the Localization preparation and Obfuscation features. A complete feature license at US$ 89 enables all features. Before purchasing a license, try out Arbed first to make sure it suits your needs. Arbed was presented at Real Word 2012 and at the ARBP Summit on March 19, 2011 in Atlanta. See my Summit resources page. You can also watch a video of the session (requires paid ARBP membership).